Assembly by Anthony Luvera is an exhibition of work created over a twelve-month with people who have experienced homelessness living in Brighton. Assembly consists of a new series of Assisted Self-Portraits; photographs created by participants; sound recordings; an installation of research on homelessness support services across the UK; and documentation of the artist’s working practice. As part of Assembly, Luvera invited individuals associated with the First Base Day Centre and the Phase One Project to use single-use cameras to create photographs of the things that interest them and to use digital sound recorders to capture their experiences. They met regularly to discuss their images and sounds and to record conversations with the artist. Participants were also invited to learn how to use digital medium format camera equipment, over repeated sessions, in order to work on the production of a self-portrait for the artist’s ongoing series Assisted Self-Portraits. For the creation of this new body of work, Luvera also collaborated with The Cascade Chorus, a choir of people in recovery that rehearses in St Stephen’s Hall. 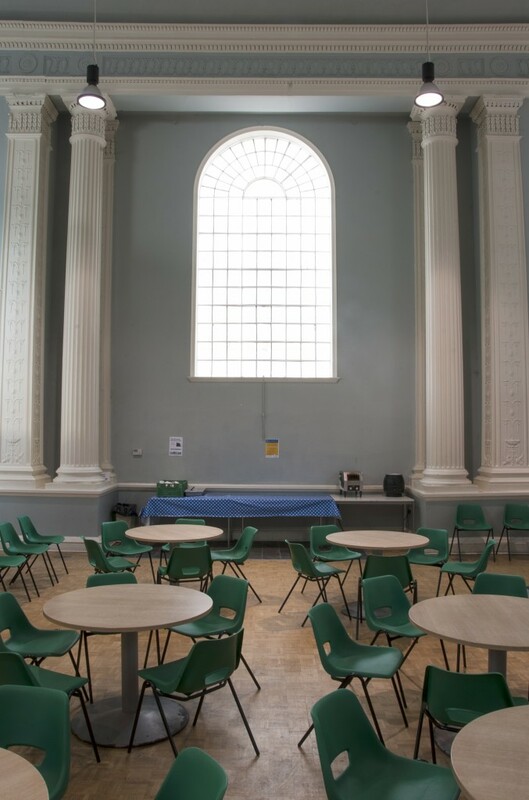 This Regency period hall was formerly located near the Pavilion Gardens and was one of the most popular assembly rooms of eighteenth century England before being moved brick by brick to Montpelier Place, where it is now the home of the First Base Day Centre. Assembly features a representation of the artist’s exchange with the community choir in this unique architectural and social setting, through sound recordings and performance. Considering the ways policy, legislation and services, at both local and national levels, assist or otherwise impact on people experiencing homelessness is an important aspect of the research underpinning Luvera’s practice with homeless individuals. Unique to Assembly is the work Frequently Asked Questions, a collaboration between the artist and a participant, Gerald Mclaverty. This installation invites the audience to contemplate correspondence with council representatives of forty cities and towns across the UK, and the range of responses and information provided. Commissioned by Brighton Photo Fringe in partnership with the Brighton Housing Trust First Base Day Centre, the Phase One Project and Cascade Creative Recovery. Sponsored by Colourstream, Brighton and Brighton Photo Fringe print partner Metro Imaging. Funded by Brighton Photo Fringe and the National Lottery through the Big Lottery Fund.